Action from Bexhill United's 3-0 defeat at home to tomorrow's opponents Lingfield earlier in the season. Bexhill United manager Ryan Light is targeting 11 points from the football club’s final six league games this season to reach the 60-point mark. The Pirates are currently fifth in Macron Store Southern Combination League Division One and are aiming to finish high enough up the table to qualify for next season’s FA Cup. Bexhill still have to play the division’s bottom two teams and three of the top six during a run-in which will begin with a trip to third-placed Lingfield tomorrow (Saturday). Light’s charges will be targeting a third victory away to top four opposition in less than two months having won 5-1 at Wick in January and 3-1 against Langney Wanderers last time out a fortnight ago. That was Langney’s first home league loss of the season and Bexhill will be aiming for a repeat performance against a Lingfield side which has taken 34 points from a possible 36 on home turf so far. 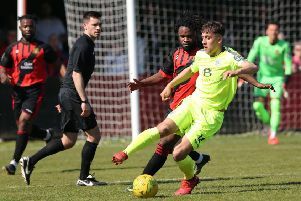 “It’s another game where we want to go and mess up a few of those records,” continued Light, whose team is nine points behind Lingfield having played an extra match. “After Lingfield’s defeat on Saturday (away to AFC Varndeanians), if we had picked up maximum points over those two home games we lost (against Storrington and Hailsham Town last month) we would be going there really chasing down third place. “As it is I think it’s too far out of our grasp with the amount of games left. It’s mathematically possible, but highly unlikely. People have got to slip up for us to capitalise so we’re on our own little crusade to pick up as many points as possible. Bexhill goalkeeper Dan Rose is rated 50-50 with the knock he picked up against Langney, but everybody else should be fit and available for the final game before the Division One Challenge Cup semi-final against Oakwood at Newhaven FC on Wednesday March 28. Bexhill’s scheduled trip to Billingshurst last weekend was postponed due to a waterlogged pitch and with their second-bottom opponents still having 12 league games to cram in, the match has been rearranged for Tuesday April 17. Light said: “Our games are going to come in little clusters now. I think we’ve got three in six days starting with the semi-final and then another three where that one’s been put in at the end. “We wanted to play again quickly after the Langney Wanderers game and keep our run of form going, but credit to Billingshurst; they let us know early.